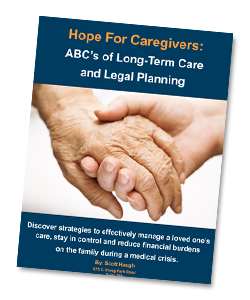 You may be struggling to pay for long-term care services, hitting roadblocks and waitlists in trying to get your loved one placed in an appropriate facility, or constantly fighting with doctors, hospitals (or even other family members) because you don’t have the necessary legal or financial authority to oversee your loved one’s affairs and/or care. Critical conversations you must have NOW with a sick or disabled loved one to simplify your job as a caregiver and help you carry out your loved ones wishes with grace and ease. How to use legal planning to get your loved one eligible for MEDICAID benefits instead, which covers costs that Medicare does not—even if your loved one initially has too much income or too many assets to qualify. The most important legal documents you need to stay in control of your loved one’s medical and financial affairs, without having to deal with the expenses, delays and intrusions of the local Courts. The most important information to gather from your loved one so that you are prepared to “pull the trigger” on your care plan in the midst of a medical crisis. At the end of the Caregiver Guide, you will receive a certificate to meet with a Haugh Law Group attorney at no-charge, to have all of your remaining questions answered and help you begin the process of creating a solid legal plan for your loved one’s protection and your peace of mind.